Located on The Alameda in downtown San Jose, Arena Hotel is just 1 block from HP Pavilion, home of the San Jose Sharks. Located in South San Jose, this hotel is within 9 mi (15 km) of Montgomery Hill, Coyote Creek Golf Club, and Raging Waters. Lake Cunningham Park and Cinnabar Hills Golf Club are also within 9 mi (15 km). This smoke-free hotel, renovated in 2013, is within 2 miles of San Jose International Airport and 4 miles from downtown San Jose. 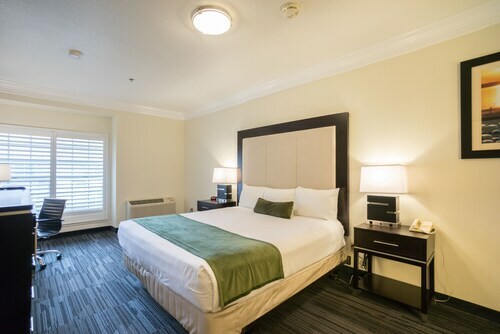 Ideal Silicon Valley hotel with easy access to some of Silicon Valley's well known corporations as well as the Winchester Mystery House, Downtown, and the San Jose Convention Center. San Jose State University and SAP Center are 2 miles (3.21 kilometers) from the hotel. 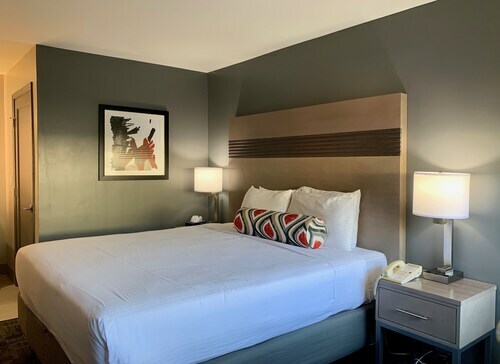 This family-friendly San Jose motel is located near the airport, within 3 mi (5 km) of San Pedro Square, SAP Center at San Jose and San Jose Convention Center. San Jose State University and Tech Museum are also within 3 mi (5 km). Gish Station is only a 4-minute walk and Mineta Airport Station is 15 minutes. Located in Downtown San Jose, this motel is within a 10-minute walk of San Jose Museum of Quilts and Textiles, San Jose Convention Center, and Tech Museum. San Jose State University and San Jose Center for the Performing Arts are also within 15 minutes. San Antonio Station is 7 minutes by foot and Convention Center Station is 8 minutes. 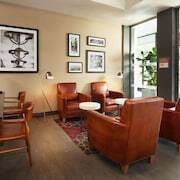 Located in Downtown San Jose, this hotel is within a 10-minute walk of San Jose Museum of Quilts and Textiles, San Jose Convention Center, and Tech Museum. San Jose State University and San Jose Center for the Performing Arts are also within 15 minutes. San Antonio Station is 6 minutes by foot and Convention Center Station is 8 minutes. 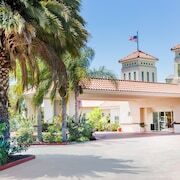 This San Jose hotel, which has hosted four presidents, offers a prime location one block from the convention center; the Tech Museum of Innovation is across the street. 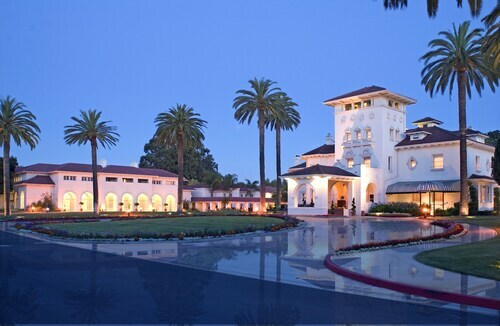 Located in the tech hub of Silicon Valley, close to the offices of some of the most influential companies in the world, these suites offer dignitary-level privacy services and are linked to San Jose Airport by free luxury chauffeuring. 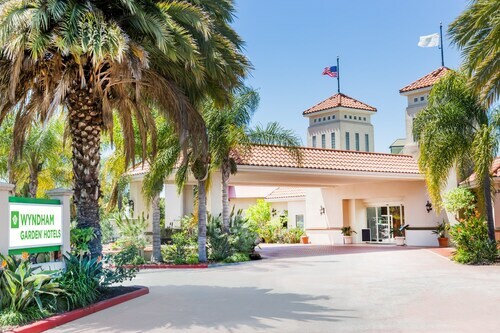 This San Jose hotels lies within reach of the culture of San Francisco, vineyards of Napa Valley, beaches of Santa Cruz and a number of golf courses. San Jose International Airport is 15 miles away. How Much is a Hotel Room in San Jose? Hotels in San Jose start at $83 per night. Prices and availability subject to change. Additional terms may apply. If you are booking lodgings in or near San Jose, it is useful to know that there is a treasure trove of possibilities awaiting you. If you're going to stay within 6 miles (10 kilometers) of the heart of San Jose, Travelocity's hotel database lists at least 70 hotels and apartments that match that criteria. 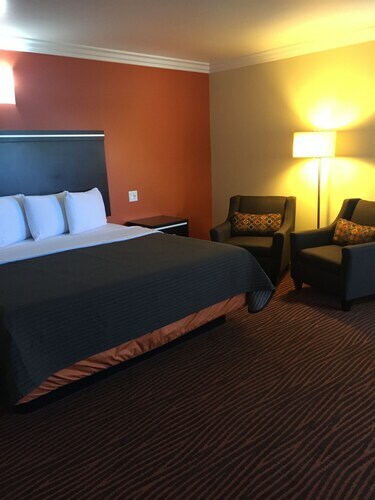 Accommodations that you can discover within easy walking distance of San Jose's downtown, are the Holiday Inn Express San Jose-Central City and Hampton Inn And Suites San Jose. San Jose is best known for the Winchester Mystery House. Within just a short stroll of this icon you can find the Hotel Valencia Santana Row and Holiday Inn Express Hotel & Suites Santa Clara. Enjoy the area around the San Jose State University by reserving a hotel room at the Hotel De Anza or the The Fairmont San Jose. 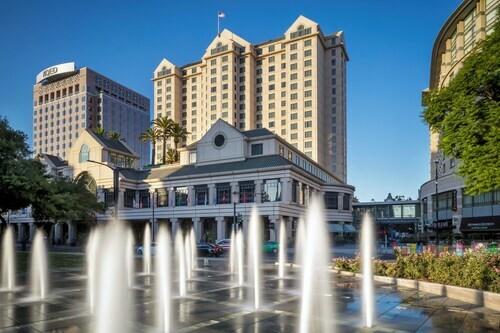 If you and your friends think you would rather check out the area near to the Tech Museum, consider the San Jose Marriott or the The Westin San Jose. The San Jose Convention Center and the San Jose Museum of Art are two more significant San Jose sights. The Hyatt Place San Jose/Downtown and the Hilton San Jose are within walking distance from the San Jose Convention Center. Alternatively, the Four Points by Sheraton San Jose Downtown and the Arena Hotel are near the San Jose Museum of Art. 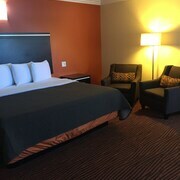 If you are planning a San Jose visit, but are on a budget and simply are after the best priced accommodation options, our hotel database also has affordable hotels to choose from in the vicinity. 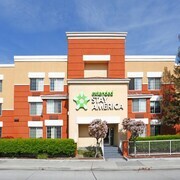 5 miles (8 kilometers) away from San Jose's downtown area is the Extended Stay America San Jose - Airport. The Arena Hotel is only 3 miles (5 kilometers) away. The Quality Inn and the Extended Stay America San Jose - Edenvale - South are two alternative lower-cost options that are worth a look. The Rosewood Cordevalle is around 20 miles (34 kilometers) from the downtown area of San Jose. Also, the Hotel Los Gatos is 9 miles (15 kilometers) away. 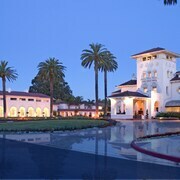 Another option is to make a booking at the Sheraton Sunnyvale Hotel or the The Inn at Saratoga. Like to travel a little out of the center? Northern California lays claim to many impressive attractions worth checking out. Northern California offers mountains, and commonly visited sights are art museums, art galleries and street art. Tireless travelers may also take part in snowboarding and skiing in the region. Fremont is 16 miles (26 kilometers) to the north of San Jose and boasts Mission San Jose and Northwestern Polytechnic University. 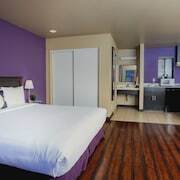 Fremont hotel establishments include the TownePlace Suites by Marriott Newark Silicon Valley and Holiday Inn Express Fremont-Milpitas Central. 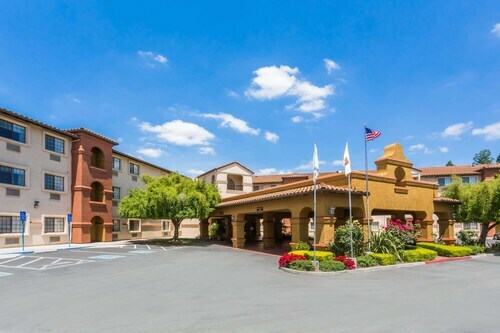 20 miles (34 kilometers) to the southeast of San Jose, you'll reach San Martin, home to the Holiday Inn Express Hotel & Suites San Jose-Morgan Hill and Hampton Inn Morgan Hill. The Coyote Lake County Park and Creekview Vineyards are some more popular sites to discover for those visiting San Martin. If you are planning on arriving or departing through Reid Hillview Airport, you may choose to stay at Best Western Lanai Garden Inn & Suites, or Fontaine Inn Downtown-Fairgrounds, which are both conveniently close. We had never used a Staybridge property before this stay. Working through the Travelocity platform, this one popped up at what seemed like a great price (a Sunday night). After doing some more research, we chose this property and it was a home run! 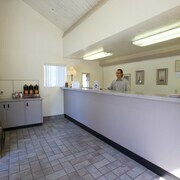 It was clean, spacious and staffed by wonderful folks. We will put Staybridge down as another go-to chain. And we will use this property again without any hesitation on our next stay in San Jose. Property was great and comfortable. Thank you. I would stay there again. Cleanliness was great. Limited parking. Not enough spaces for guest.